Two Bears Farm and the Three Cubs: Happy Holidays! We've had an exciting month, full of festivities here with the boys. We've watched Rudolph the Red Nosed Reindeer 4,389 times. And we've watched my favorite, Emmett Otter's Jug Band Christmas 2 times. Mommy got the short end of the stick this year. 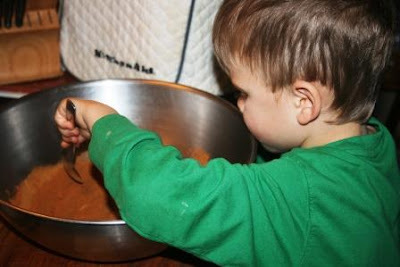 We filled the house with the smells of Christmas by making applesauce cinnamon ornaments. Pierce really had fun with ornament making, even though he was disappointed they weren't edible. They did make nice little gifts for family and teachers though. We also made peanut butter kiss cookies and decorated sugar cookies. Those were edible. 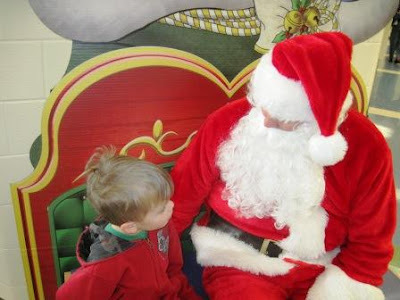 And Pierce had a fun time attending the Winter Wonderland festival at his school and chatting it up with Santa. His first question being, "Is your sleigh up on the roof of the school?" Five year olds ask tricky questions. 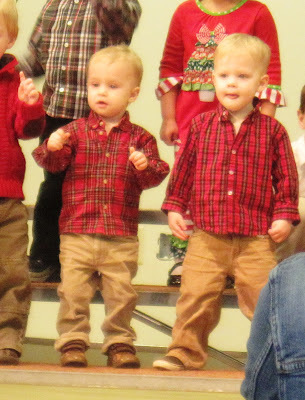 Cort and Reid had their own Christmas program. During which they sang songs. Cort got really into it. Reid tried to run away and was chased down by a teacher. At least they waited until after the program to pump them full of sugar. From our family here at Two Bears Farm, wishing you and yours a very Happy Holidays! Hey Lisa wasn't to wish you a very merry christmas! !! I hope Santa is good to you and the boys!! Such a great time of the year. This season so wonderful for little children. I kinda miss mine being little....but....that's what grandkids are for! Merry Christmas! I love those cinnamon ornaments,they smell so good! The little ones are the most fun to watch at pageants! I love the Emmitt Otter movie!! Was it on TV or is it on DVD?! It's been forever since I last saw that cute movie. Merry Christmas to your family, Lisa! Happy Holidays, Lisa!! Hope you and the fam enjoy! Sounds like you are ready for Christmas to me. Merry Christmas Lisa, to you and your Family. My kids watched Emmet Otter 3x yesterday! Merry Christmas! Thanks for the pictures Lisa! It's been so fun this past year seeing your family through your posts. Have a wonderful Christmas!! I wish you the very best of Christmas! I have never heard of Emmitt Otter. I feel like I'm missing out! All of your pictures are so precious. Sure makes me miss those days. Your boys are really growing up. Merry, Merry Christmas to you and your family, Lisa! 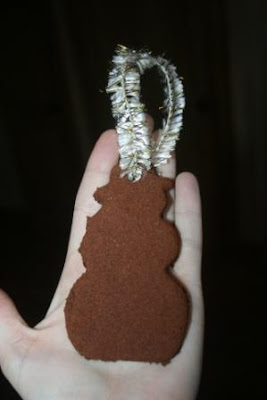 Years ago my mom made cinnamon ornaments just like those! I've never seen anyone else do them until today! Merry Christmas... I love the ornaments you all made. I love making those ornaments. They smell so good. Your boys are so cute! Christmas is a bit extra special when they are young like that. Have a very Merry Christmas! Isn't it amazing how different the personalities of the twins are???? 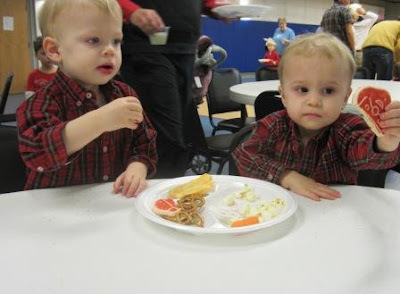 My friend has twin grandsons (about the same age as yours)--and Judy (friend) is always talking about how different they are--one from another. The boys "getting in to it "gave me a good laugh. Have an enjoyable holidays. So cute! What wonderful memories you are making. it's so fun to experience Christmas through the eyes of our kids. Merry Christmas to you and your awesome family. Merry Christmas and Happy New Year to you and your family Lisa. A wonderful post.. You have just brought back some wonderful memories.. My son is 27 now but those early years never leave you. I wish you and your lovely family a very Merry Christmas. thanks for sharing this sweet post! your little ones are so darn cute! What beautiful blessings your boys are. Such sweet photos. Wishing you all a merry Christmas and a happy and healthy new year. Merry Christmas to you Lisa. 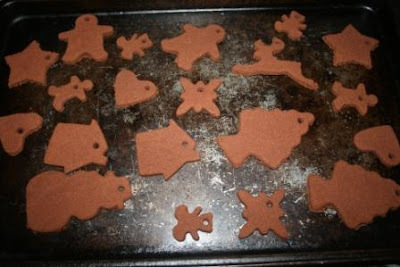 We made those cinnamon ornaments one year and my daughter's boyfriend actually ate one. eww! sounds like you guys have been having a great holiday season : ) the pageant pics are super cute : ) all three of your boys are so cute lisa.